Yes, nubrella is the first true hands free umbrella in the world. 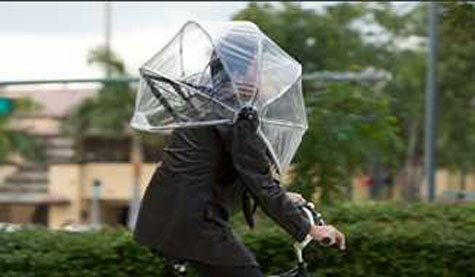 You are probably already imagining all the times you wished you had a hands free umbrella, well now you can. So the time is now to add nubrella to your arsenal of weather protection gear and stay outdoors! Nubrella exploits the fundemental flaws of today’s traditional umbrella design. Many will believe nubrella is a “better mousetrap” for more inclement weather conditions. Nubrella utilizes a new patent pending “shoulder straps” and “offset handle” so it can be used completely hands free. With an oval, streamlined and aerodynamic design, it stops rain, wind, snow and extreme cold- and keeps your head, face and shoulders dry. The makers tout it as the first true hands free umbrella in the world.